At XM we offer Motor Oil (MORr.at) stocks as cash CFDs. Our cash CFDs stocks are undated transactions that aim to replicate the cash price of the underlying stock, and so they are adjusted for any relevant corporate actions. Motor Oil (Hellas), Corinth Refineries S.A. is a Greece-based petroleum company founded in 1970, with its headquarters in the Greek capital city, Athens, and it belongs to the largest companies in its industry in the Mediterranean region. Motor Oil specializes in the refining and transportation of petroleum and other petrochemicals to various parts of Greece and abroad. The company is also notable for operating Corinth Refinery, the second largest oil refining complex in Europe. The company stock is traded on the Athens Stock Exchange (Athex). *** Note that the maximum trading volume for Motor Oil per client is 145 lots. This limit will be reviewed on a daily basis and updated according to the value of the instrument. 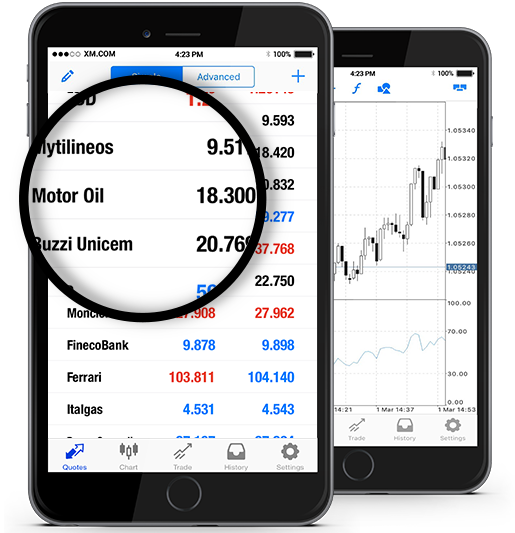 How to Start Trading Motor Oil (MORr.at)? Double-click on Motor Oil (MORr.at) from the “Market Watch” to open an order for this instrument.